From left, Jordyn Hunt, 9, Sydney Hunt, 6, Taylor Hunt, 11, and Jim Goggin support a ‘yes’ vote on the Naugatuck High School renovation referendum outside the Naugatuck Train Station Tuesday evening. The referendum passed 1,756 to 944. NAUGATUCK — Borough voters breathed new life into Naugatuck High School. 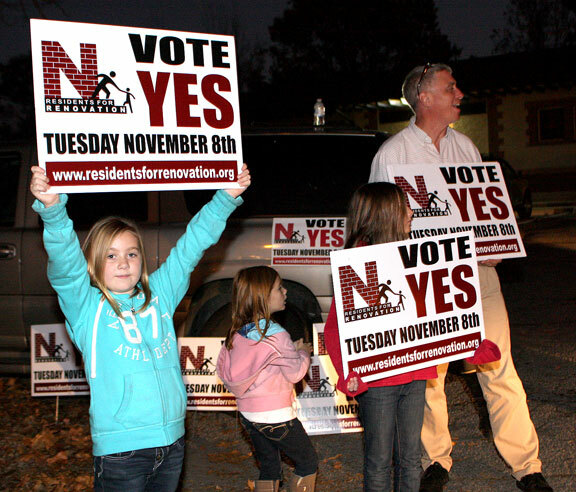 By an unofficial count of 1,756 to 944, which doesn’t include the results of about two dozen absentee ballots, voters approved a $81-million plan to renovate the high school as new at a referendum Tuesday at the Naugatuck train station. “I’m thrilled for the citizens and the students of Naugatuck that we’re going to be able to go ahead with this project,” Board of Education Chair David Heller said after learning about the results Tuesday night. About 15.5 percent of borough voters turned out for the referendum. “This project is a no-brainer,” said Dave Pires, who voted in favor of the project. 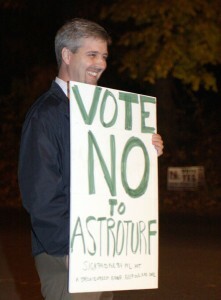 Pires said he was voting for the future of Naugatuck. Jean Dobbin was also thinking about future generations and her two granddaughters when she cast her vote in favor of the renovations. The project will completely overhaul the school, which was built in 1959 with additions in 1974 and 2003. Currently, the high school is in a state of disrepair. Cracks are a common sight in walls and floors, the infrastructure is deteriorating, and the building is in violation of a number of health and safety codes. The renovations would make the building code-compliant, improve technological infrastructure, add a new entrance and intermission plaza to the auditorium, possibly provide for air conditioning and a backup generator so the school can be used as a shelter during massive power outages, revamp the pool house, create new fitness and dance rooms, and enlarge lockers, among many other changes. “It’s a multi-faceted building that provides opportunities for not only students but for the entire community of Naugatuck,” Heller said about the soon-to-be renovated school. As part of the project, the Board of Education central office will be moved to the school, and the football field will become a multi-sport synthetic turf field. With a better school, Janet Ireland felt more Naugatuck residents would stay in town for their education. “I’m tired of seeing (Naugatuck students) going to Sacred Heart or Holy Cross,” said Ireland, who voted in favor the plan. The borough’s state reimbursement rate is 75 percent for much of the project. Exactly how much Naugatuck will have to bond for its share won’t be known until officials submit finished plans to the state. Officials estimated the town’s cost will be between $25 million and $37 million. Based on Controller Wayne McAllister’s estimate that the borough would spend $30 million, the project could increase property taxes by $2 next year for a home assessed at $200,000. In 2018, the year of the biggest jump, the project could mean a $42 tax increase for a home of the same value, although Grand List growth and the impact of revaluations every five years remains unknown. The uncertainty around the cost of the project was a criticism of the plan leading up to the referendum and the reason why Shirley Anderson cast her ballot against the project. Anderson said she was too uncertain about what the project would ultimately cost to vote for it. “I feel that there was another way to go about it,” said Anderson, who felt the town didn’t give out enough information for voters to make a decision. With the affirmation of the voters in place, the next step for the borough is to hire an architect to design plans and submit them to the state. If everything goes as planned, work is expected to begin next fall and be completed in the summer of 2015. 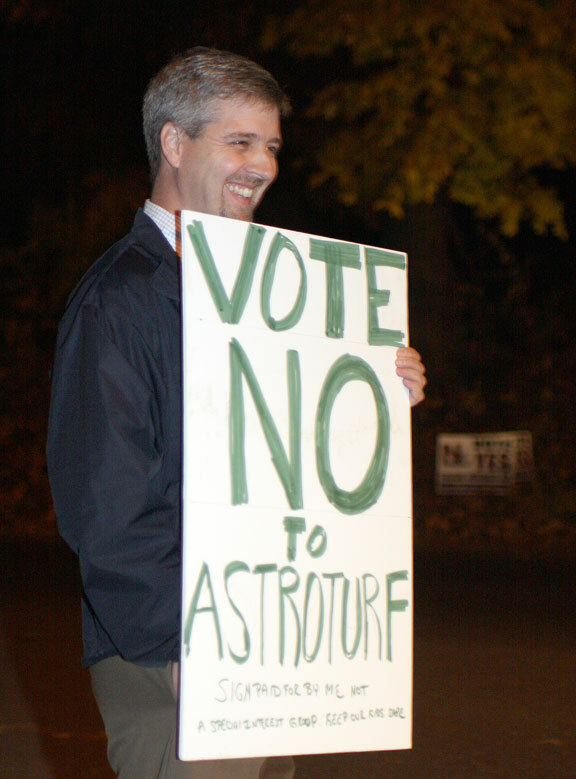 Ed Fennell opposed the Naugatuck High School renovation plan because he thought the synthetic turf fields included would be a waste of money. ‘The fields will be worn out before we finish paying for them’ Fennell said. Heller said he’s thankful for the leadership and efforts of Superintendent of Schools John Tindall-Gibson, Mayor Robert Mezzo, and the Residents for Renovation group in helping to get the project to where it is today. “The citizens of Naugatuck realize Naugatuck High School is the centerpiece of our community, and it’s a valuable asset for both our students and our entire community,” Heller said.